Red Buck Filtered Cigars are known as the ‘America’s Outdoor Smoke’, made with the finest tobacco grown in the world - Kentucky Burley Leaf. Red Buck Filtered Cigar consists of blended toasted tobaccos, rolled in a light air-cured burley and a natural tobacco wrapper. Each of these discount filtered cigars consists of earthy blends of flavors giving the results of a long lasting slow burning premium tobacco with a pleasant aroma. 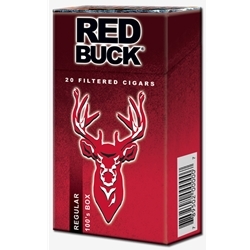 Red Buck Filtered Cigars offer a wide range of flavors to appease every smoker’s taste buds. Once you’ve try one, you will see why the Red Buck brand is quickly becoming a consumer favorite! Red Buck Filtered Cigars are distributed nationwide by Xcaliber International located at One Tobacco Road, Pryor, OK USA. Styles available: Full Flavor, Smooth, Menthol, Menthol Lights, Grape, Peach, Vanilla, Cherry, Strawberry, and Sweet. Switching to filtered little cigars is a great way to save money in an over-priced world. Here at Smokers Discounts we believe you should too! We’ve made it easy and affordable to buy filtered cigars online. Call us for more details!